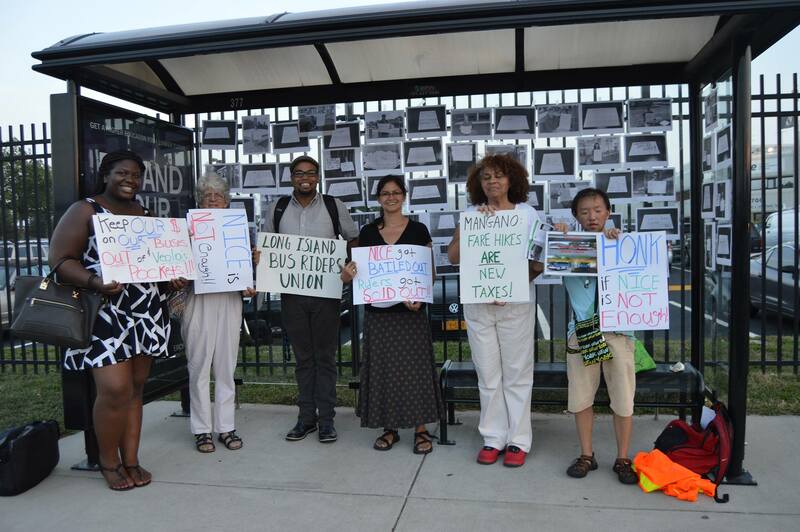 HUGE VICTORY FOR LONG ISLAND BUS RIDERS! Members of the Long Island Bus Riders’ Union celebrate a HUGE VICTORY after presenting a list of rider demands to Nassau County and NICE Bus in early September. A bus rider will be added to the Transit Advisory Committee, which oversees the NICE bus system, adding a level of representation that was not there before. This gives bus riders the opportunity to advocate for the kind of service THEY need! Additionally, after countless efforts to get the County to invest more in public transportation, they have bumped up their contribution by $2M! While the operational needs of the bus system are well over the $4.6M that is in the 2015 budget, this is another victory for bus riders across Nassau County! THE RIDERS UNITED WILL NEVER BE DEFEATED! A bipartisan agreement by Nassau lawmakers will boost the county’s subsidy to its bus system by $2 million, freeze fares for some customers in 2015, and give NICE riders more say on issues that affect them. The plan, included in Nassau’s newly adopted 2015 budget, increases the county’s subsidy to the Nassau Inter-County Express to $4.6 million from the previous $2.6 million. It promises to hold a ride to $2.50 for customers who pay in cash or with NICE’s mobile application, and will add four new members to the county’s Bus Transit Committee, which governs NICE. The four new members will include two appointed by County Executive Edward Mangano, one by the Republican majority, and one by the Democratic minority. Democratic lawmakers said they plan to make their pick a riders’ representative, chosen in conjunction with the nonprofit Long Island Bus Riders Union. “NICE Bus continues to save taxpayers millions of dollars while protecting riders from a fare hike or service cut,” Mangano said in a statement Thursday. But the new county budget was not all good news for riders. Even with the increased subsidy, NICE still runs a deficit of about $6 million, according to figures in Mangano’s originally proposed executive budget. And Nassau’s vow to not raise fares outside of any hikes on the MTA-controlled MetroCard removes one of the county’s options to help fill the deficit. Officials with Veolia Transportation, NICE’s parent, declined to comment Thursday. Long Island Bus Riders Union spokeswoman Anita Halasz said she fears that, without further government subsidies, Veolia may be forced to cut service to fill a budget gap, as it has before. Halasz added that she was grateful that riders will soon be able to voice their concerns on the county Bus Transit Committee, even if that voice may be “diluted” by the addition of three additional Republican appointees. In total, seven of the panel’s nine members will be appointed by Mangano or the GOP majority.